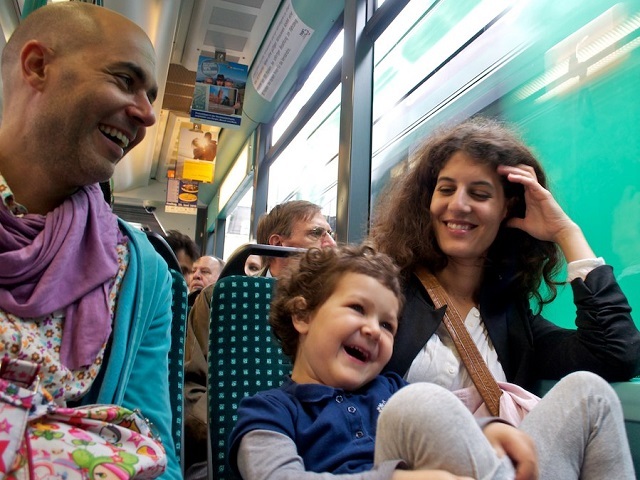 A family travels by train in Germany. There are numerous benefits of sustainable transport, including ditching the stress of family road trips. Today's Friday Fun features infographics that highlight the many pros of shifting away from private vehicles. Photo by Edo Medicks/Flickr. They say a picture is worth a thousand words. So what about an infographic? Information graphics, or infographics, recently emerged as a highly popular and effective medium for visualizing and sharing information. According to visual.ly, a website that helps users tell their stories visually, an infographic is: data, sorted, arranged, and presented visually. In other words, an infographic is a visual image used to convey information. Infographics are powerful. Why? Mark Smiciklas, a digital strategist and consultant, offers three simple explanations: Infographics are easy to digest, easy to share, and cool. Further, the range of information infographics can convey is literally infinite – infographics even come in handy to explain sustainable transport. For today's Friday Fun, here are a few great infographics courtesy of the Cities Collective, a partnership between Future Cape Town and Urban Times. These infographics highlight the many co-benefits of sustainable transport – which are so numerous that when you focus on just one it's easy to lose sight of the others. From increasing access to economic opportunities like jobs and markets, improving road safety, reducing traffic congestion and passenger travel time, mitigating vehicle emissions that contribute to climate change, and making our cities healthier and more livable, there's a lot to keep in mind. The bottom line is that alternatives to private vehicles – like public transport, walking, and bicycling – can be safer, more effective, healthier for you and the environment, and fun. As a reader of TheCityFix, I bet you didn't need an infographic to tell you that. Enjoy!